How bright should the lighting in a clothes closet be? The 2014 National Electrical Code does not mandate lighting levels for any occupancy. It does however specify where lighting is required and where it must be located. Although luminaires are not required to be located in clothes closest, the N.E.C. does specify which types of lighting fixtures are allowed in these areas and where they must be installed. This month’s article takes a look at lighting in clothes closets. Definitions are critical to understanding the electrical code. Article 100 gives us definitions that apply throughout the code. The .2 section of each article provides definitions that apply specifically to that article. In section 410.2 of the 2014 N.E.C. the definition of a closet storage space can be found. This definition is necessary to understanding the requirements for locating lighting fixtures in clothes closets. The closet storage space is defined as the volume bounded by the sides and back closet walls and planes extending from the closet floor vertically to a height of 6 feet or to the highest clothes-hanging rod and parallel to the walls at a horizontal distance of 24 inches from the sides and back of the closet walls, respectively, and continuing vertically to the closet ceiling parallel to the walls at a horizontal distance of 12 inches or the width of the shelf, whichever is greater, for a closet that permits access to both sides of a hanging rod, this space includes the volume below the highest rod extending 12 inches on either side of the rod on a plane horizontal to the floor extending the entire length of the rod. This definition is easiest to understand when looking at Figure 410.2 in the N.E.C. As related to luminaire locations, the closet storage space is defined as the area 12 inches from the back and side walls of the closet or the width of any shelf, whichever is greater. Section 410.16(A) tells us that incandescent fixture types must have a completely enclosed light source. LED luminaires must also have a completely enclosed light source unless they are identified as suitable for installation within the closet storage space. Fluorescent luminaires may have open bulbs. The picture that accompanies this article shows an open bulb, incandescent, recessed, lighting fixture in a clothes closet and is a violation of the N.E.C. as stated in 410.16(B). Incandescent luminaires with open or partially enclosed lamps and pendant luminaires or lampholders shall not be permitted in clothes closets. 410.16(C) gives the rules for the location of permitted fixture types in clothes closets. The minimum clearance between the luminaire and the nearest point of storage space shall be 12 inches for surface-mounted incandescent or LED luminaires. The required storage space for a clothes closet is 12 inches from the back and side walls and when combined with the minimum 12 inches of clearance from this storage space the code requires that these fixture types be located at least 24 inches from the back and side walls of the closet. Surface-mounted and recessed fluorescent, along with recessed incandescent and LED luminaires must be located at least 6 inches from the storage space. Again, if you add the 12 inches required for the storage space, you find that these fixture types must be installed at least 18 inches from the back and side walls of a clothes closet. If the width of the shelving in the closet is wider than 12 inches, then the minimum clearances from the back and side walls must be added to that measurement instead of the 12 inches. Surface-mounted fluorescent and LED luminaires may be installed within the closet storage space only where they are identified for such use. 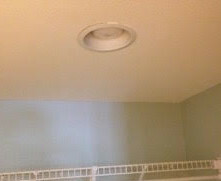 Like all of the code requirements, the location of lighting fixtures in clothes closets is mandated to ensure safety. Clothes closets are commonly used to store combustible material and with lighting fixtures being a good source of heat, the lighting needs to be located away from this material to prevent possible ignition. If the lighting fixture was located directly above a storage shelf and the stored clothing, papers, cardboard, or other easily ignitable materials were in contact with the lamp, a fire could easily start. Many homeowners forget to turn off the closet lighting and close the door. This easily forgotten heat source can be a potential fire hazard. classes4contractors.com has electrical training courses, electrical exam preparation classes, free electrical practice exams, live seminars, private classes, and electrical practice questions to help you learn more about the National Electrical Code or prepare you for your upcoming electrical exam. We also offer on-line continuing education courses for Texas electricians as well as live CE classes for Ohio, Alabama, and other states. Our instructors have decades of experience and are licensed electrical contractors and master electricians. We also offer live instruction and private classes. Spend some time browsing our site and please email any suggestions or questions to classes4contractors@gmail.com. Send us a picture of a code violation or a proper installation and if we use it in an article, we will send you a great prize. How Big Should That Bonding Jumper Be? Is that a grounded conductor?